She was due on July 26th, 2009. The day came and went and I tried to be patient as all very pregnant, very tired, expecting mothers do. It was important that I wait this time especially since I was trusting God for a VBAC (Vaginal Birth After Cesarean) birth. My first two boys were born in the hospital with epidurals, and Deacon was unfortunately cut from my body and almost suffocated with fluid in his lungs because of liability practices. Yes, I’m still bitter. 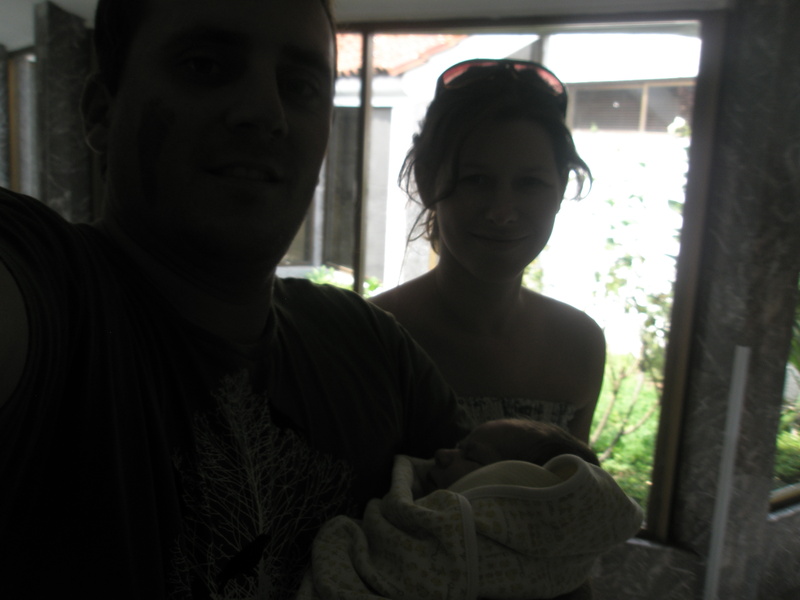 But this baby, this baby would be born in Mexico under the loving care of our Mexican doctor and our beloved doula. Mexico, where people don’t sue someone over spilt coffee and where I would be free to labor as long as I needed without an imaginary 24 hour cut-off rule with my water broken. If you have ever had a baby, maybe you speak this language. And so it came and went, July 26th, 2009. And the next day passed, and the next, and the following week…and had I been in the states I would have been made to have a repeat C-section, but thank God, this was Mexico and as long as the baby was fine, I could stay pregnant. And then she was ready. At 4 am on August 15th my water broke. I woke no one, simply got out of bed and went to take a shower. I was alone with my secret while all my loves slumbered into the small morning light. I lay back down and the contractions came slowly and radiated joy throughout my heart. The baby would come soon, but I would not rush for help or seek to be hospitalized this time. I was made for this, and I believed it for the first time. There was no fear. I woke Nathan and we called Dr. Jose’ Luis to let him know the progress. I woke Mom, in from Texas awaiting the new arrival. We slipped away in the night and made the drive to Guadalajara. The day was just beginning and the city was alive with cars and noise and people rushing off to work. We talked about baby names and reveled in the excitement. We dropped our bags at the birth center and then spent the day walking around the city, went to Starbucks, followed Mom through a tack store and looked at Mexican saddles, picked up a few things at the grocery store, ate lunch. When a contraction came I would hold on to Nathan and wait it out, then walk again. Around 6pm we made our way back to the birth center. Our 4 am wake up that day was catching up and I needed to relax. We slept for 3 hours. The three of us, well, four of us, on the “matrimonio” size bed. At 9pm I woke up, the contractions allowing me no sleep. I had work to do. Sweet Joni, our doula, came to the center and we prepared the tub and the room where Phoebe would finally make her entrance into the world. I remember peace. 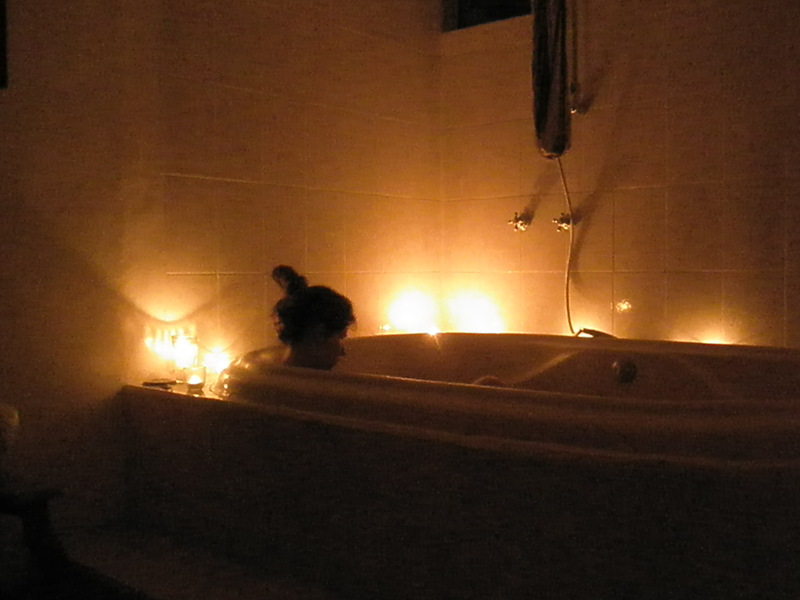 And candles, and a soft blanket of darkness and aromatherapy, and the water. There was nowhere else I wanted to be. And then we worked together, me and Phoebe, God and Nathan and Jose’ Luis and Joni and my Mom. Mostly everyone stayed in the background, quiet, encouraging when needed, but simply standing by. Beauty and agony ensued in that careful place between womb and world. I teetered on the edge of great victory and insanity. Nathan prayed like the voice of one crying in the wilderness but I could not decipher his words between my groanings. Pain and triumph and mystery, anything worth it begins this way. And 26 hours after that 4 am water break, my Bright Illuminated Light was born from water into water and into her Daddy’s arms. He baptized her with tears and pulled her to his chest. A girl! The impossible! We had a daughter. It was August 16th, 2009. Thank you God for this daughter. She was due on July 26th, 2009. On July 26th, 2013 we were told the cancer was back. This waiting for Phoebe is a familiar place. We have been here before. The room is quiet, “no light!” she says. Be still. And I find that primal instinct in myself to close out the world as it goes on, with its busy-ness and rushing to and fro in all its self-importance. We’ve got work to do here. We have a transition to make. God-willing, an eleventh hour healing. But if He chooses to heal her home to Him, we trust. We encamp around her now, sleep near, keep a watchful eye. She sleeps mostly, can no longer walk, hallucinates, barely eats. And then she’ll sit up and hug her brother or tell us she loves us. Last night she giggled at “the girl in the living room roaring like a lion”. The veil is thin. Oh my goodness, what a beautiful story you have. How precious & lucky you were to be picked as Phoebe’s mommy. I pray God heals her. I know He holds her close. Thank you for sharing this with us. We are blessed to know Phoebe through her wonderful parents. Love & hugs to you & your sweet family. I read this with closed up throat and deep sobs. My heart aches for you my friends and the reality you are facing. I have lots of tears and little words. I love you and I am praying for you! So many around me are. You are surrounded by a great cloud of witnesses in heaven and on earth. You are loved! So beautiful. My momma heart aches for your momma heart..tears and prayers from Minnesota. So very beautiful! Prayers continue…. Yes, as Elaine said above, my thought is of Mary chosen to be Jesus’ mother – how lucky and blessed and deserving – but how much agony to bear. Believe, Amey, that you are as beloved to our Father as Mary and you, Nathan, as Joseph – so much trust and faith asked of you and required. I believe our Father feels the same agony now as during His son’s death on the cross and for such a mighty reason, Jesus would not be spared. But I pray that Phoebe will be spared all pain and fear and that you will be generously given all the grace you need to endure and value your last earthly labor of love. I thank you and our Father for allowing me to participate from afar in this incredible journey. Cannot say it better. I echo Monica’s words. Tears and heartache for you. Yet believing in His promises of eternal victory and clinging to the hem of His robe. This must be One of your most beautiful posts. A depiction of that miraculous natural birth and the correlation of the wait and anticipation, the struggle and fight, of this ’11th hour.’. The fight is not over. Your gratitude ministers. We love you Amey. We Live you Fair Family. Still praying. So sweet of you to share such special memories… You all are loved by many who will know you intimately in heaven and who will continue to pray fervently for your family. Love the way you write….straight from the heart! Love the beautiful pictures too of your new little girl. What a precious gift from God she is! I am so heartbroken and pray constantly for all of you. Love, hugs and prayers to you always! Thank you for sharing this beautiful post. I just started following your story the last few weeks and it is all I think of 24 hours a day. I have prayed and continue to pray. I thought the same as others , you being chosen. What an amazing family you all are. Continued prayers and love from Virginia. God Bless You and your Family,Praying for your PRECIOUS PRINCESS she is so BEAUTIFUL! PRAYERS!!!! My heart just breaks for you and your family to have to go thru such a difficult time. I read your beautiful birthing story with tears running down my face and my throat feeling as if it was going to close off. I can’t even begin to know the unbelievable heart crushing pain that you are experiencing at this moment, while you wait and watch over your beautiful little girl, and not knowing what the next minute is going to be. The hurt and pain has to be unbearable for you and your family. Please know there are many of us that are praying and thinking of Phoebe and your family. I wish I was there to give you a big hug. You are truly a beautiful woman and a mother. Please know that even though so many of us don’t personally know you, we have all come to know and love Phoebe and your family thru your postings. Phoebe is an inspiration to all of us. May GOD comfort you and your family with peace as Phoebe begins to earn her angel wings. Amey, our prayers are with you and the family. God’s peace be with you. Amey, our prayers continue for you, your family, and sweet, precious Phoebe. We are praying so hard for your family. We walked through with my Daddy last year. No words just prayers. I’m crying; the lump in my throat is thick, I can almost see Phoebe’s birth and now this. The quiet, the stillness, the aching, the love, the tears, the prayers, the pleading alternating with trust. I’m seeing it through your words penned in pain and I’m broken for you all. I have come to love Phoebe and your family. Trusting Him to the end, to walk with you in your grief and bring Phoebe safely through. You are greatly loved. Thank you so much for keeping us informed! This story is beautiful. You and Phoebe are in my thoughts constantly. Thank you for sharing her with us. My heart aches for phoebe. Sweet little girl who I have followed for story. Prayed for her. She has touched my life and because of this I am changed forever. I pray that Phoebe has peace and she rests without pain. I pray that the whole family feels the living hands of God as he holds you all close as you walk through this. I pray that there is a miracle for precious Phoebe. Beautiful, beautiful. Phoebe reminds us, “Be still, be still, and know that I am your God. Be still, be still, and know that I am with you. By name, I have called you, by name I will save you. By name, you are mine, you are precious to me… Forever with you I will be…Before you were born, I knew you. Within your mother’s womb, I formed you. I appointed you to speak in My name…” (Carey Landry.). Prayers for His peace and love to continue to surround you all. Thank you dear Lord for Your bright child Phoebe! Wishing you God’s peace and comfort. Ohh, the dates! I have special dates for my daughter, too. Thank you so much, Amey, for sharing this. You are all so special, and Phoebe is just wonderful! Oh Amey.. this is so beautiful. I love the pics you shared. Phoebe and your family are in our thoughts and prayers daily. Your birth story…… so special. Sending phoebe so much love and peace; and I give thanks to god everyday for you sharing her with me and helping change my life. Phoebe is truly a blessing. I have no words in me to describe how I feel reading this. Amey, you have an amazing gift of words and how to use them for the greatest impact – I felt as drawn into your birthing experience as if I was there in the background, softly cheering you on. I don’t believe the dates are a coincidence. I believe God has gently shown you that He is Life and He is Death defeated and no matter what happens, He is there with Phoebe. He always has been, He always will. Thank you for sharing your heart so openly. I am continuing to pray for Phoebe and all the family as she moves closer to God. I keep having a vision of His hands of love; one cradling Phoebe, the other, her loved ones. It’s an immense comfort to know we can trust Him. Gentle hugs to all of you. “He is life and He is Death DEFEATED…” Powerful words. Thank you. There are no words I could ever muster to express how my heart aches for you. Cling tightly to His promises. May you feel His embrace like never before, and find rest in His unfailing love. You are an inspiration of faith, and this world has been forever changed by your spectacular little girl. You are in my prayers today and every day. Thank you Amey for sharing your heart, your love for this precious little girl, and your faith in our God. Words escape me – my heart aches for you and your sweet family. You have touched so many. Praying that God’s perfect love and peace will comfort your broken hearts. Amazing story love the pictures. Prayers for Phoebe and Family. What a beautiful story about a beautiful entrance into this world. Your daughter and your family are in my prayers. My own eight-month old daughter made that tremendous journey out of this life on July 16th of this year. I pray she is up there now watching over these sacred days and over all of you. Thinking of your family and praying for you all day long. Really. Many times a day I think of dear Phoebe and your beautiful family, and beg God for his blessing to be poured out on you. Every time you write an update, I weep as if she were my own. How precious of God to let strangers share your burden so deeply. I am grateful I can help you by praying. What a beautiful picture of life you paint with words. The most beautiful Phoebe doing things on her own time and schedule. Thank you for sharing your angel with all of us. My heart literally hurts for you. Love and prayers. I’m waiting and hoping, too. Such a beautiful and warm story of love and peace- such tremendous strength! Praise The Lord and God Bless you Fair family! Sent from my iPhone Cheri Perry 1-888-249-9919 You can get everything in life you want if you just help enough other people get what they want. ~Zig Ziglar 1927-2012 Rest in Peace dear friend! Just wish Cancer did not exist..
A beautifully written portrait of the peace, patience and love exhibited by parents truly touched by God’s hand. To the Fairs – prayers, gratitude and love from my family flow towards you daily as we walk along beside you on your journey of heartbreak and grace. Sweet Phoebe, may your mind’s eye be filled with the splendor and glory of heaven as you await your angels. We love you, Miracle Girl. Your words had me captured from the beginning to the end. What a beautiful birth Phoebe had, into the arms of loving parents. Father placed her well. Trusting in Father, that He knows best and continuing to seek Him for healing here on earth. Amey- this is beautiful and I have no words….all I can say is thank you for sharing your wonderful times and your heart wrenching ones. If I were in your shoes, I think I would be selfish with this precious time, but you are sharing your pain and God is using your words as a powerful testament to Him and He is changing thousands of lives. I think about and pray for you all so many times every day. Phoebe is always on my mind. I pray for a miracle and peace for Phoebe. I pray for peace for the boys. And for you and Nathan, I pray for a peace that most cannot even fathom and strength to walk each second of each day. Oh Amey, such beautiful pictures by your words. I feel, as some of the others have said, that I was there at Phoebe’s birth. And now, I am there with you and Nathan and your family in your quiet vigil, waiting as God works His marvelous will. Praying for you all as you walk this road of wonder and amazement, yet with human grief so heavy. My heart hurts for you all as you are lifted up to our Heavenly Father. As I read your update this morning, I was filled with such joy and wonderment at how blessed your family is to walk through your triumphs and trials, all with the same love, understanding and personal, overpowering Faith in God and his Beloved Son, Jesus Christ. As others have said, it is tremendous to see your perspective and comparison of Phoebe’s transitions on this earth. Truly, Amey, you and your family are among God’s Special Believers and you live this by such Grace and Personal Witness. The impact that has been made on me (and many others) has been a testament to His Love. My husband and I ache with you and for you and YES, we are still asking GOD to heal Phoebe in the eleventh hour! YOUR WILL BE DONE LORD, because we all know that YOU KNOW BEST. And so, once again I want to personally thank you for allowing us the privilege to walk with you and to have been invited into the pain. It is the family of GOD at it’s best. We are praying. We are interceding. We are holding up your weak arms as you fight this battle. We know, in part, your anguish. We are bound together by the love of prayer and know that you are on Holy Ground. You are doing the needful thing, and yes, you are not missing a moment. I love that for you. I wish the LORD could take this cup from you. I hope that HE would wake you from this nightmare. I KNOW that HE will see you through it, because HE has promised you that. Remember how thin the veil is sweet family. Heaven is just on the otherside. Our love to the boys, to you and Nathan, to precious Phoebe. to your parents, and extended family. Close out the world. It’s not only good, it’s right… and you are not alone. So many posts this day reflect what I’m feeling, agreeing with, praying for ~ and loving. This day I will gratefully echo Bonnie’ words…and you are not alone! We don’t have a word in English quite as eloquent as esperando. It describes what is happening so perfectly. Such a beautifully told story, Amey. Thank you for sharing the gift of your words as well as your precious girl’s life. I am moved by your words and by your faith. My heart hurts for you all and what you are enduring. Thank you for sharing your life, even with us who have never had the pleasure of meeting you. It will be an honor to pray for you all. Thankful that our God is Healer. Thankful for His promises. Peace be with you. Your birth story is beautiful. I am so terribly sorry about the death of your little girl. But her life and her birth will always be part of you. I’m thinking about you.